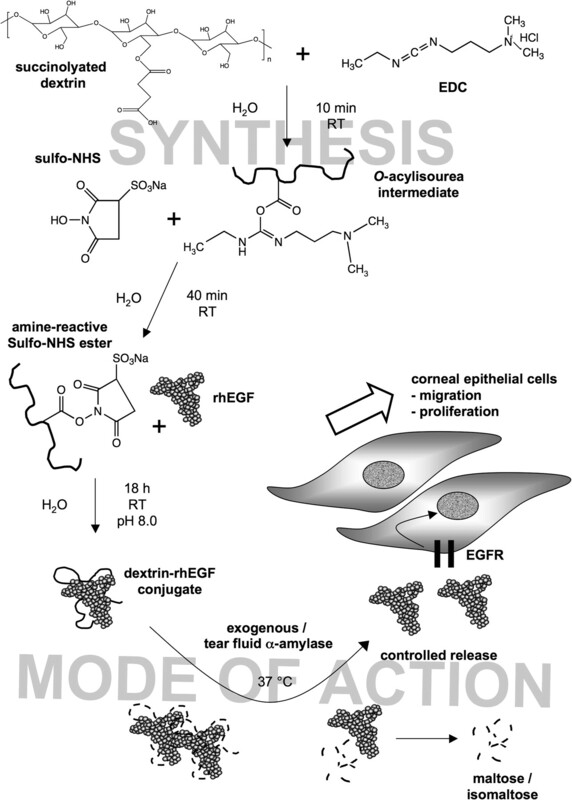 In this study, the first use of a bioresponsive polymer therapeutic agent in the promotion of corneal re-epithelialisation after injury in an ex vivo whole-eye organ culture model was described. 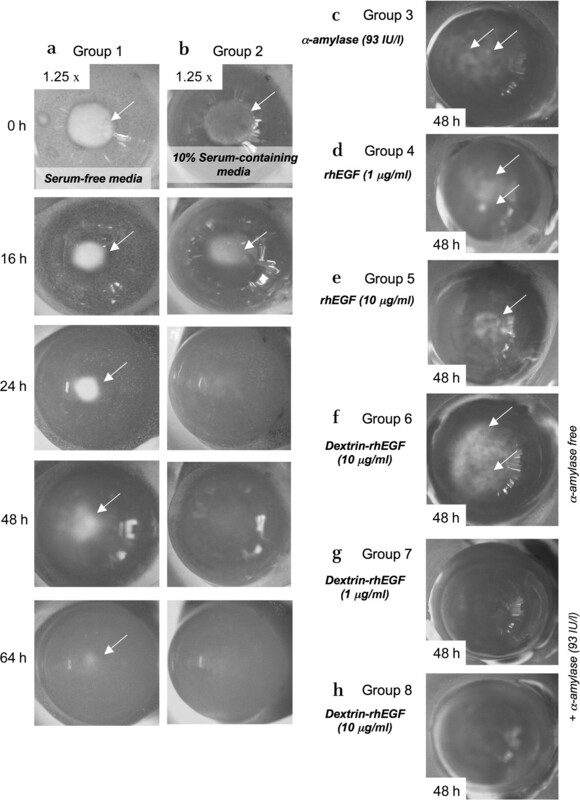 A polymer–protein conjugate consisting of dextrin and recombinant human epidermal growth factor was synthesised and applied as a single dose to a 2 mm ex vivo corneal ulcer, in culture. Enhanced wound healing was observed in response to dextrin–recombinant human epidermal growth factor, when exposed to α-amylase, compared with controls. This highlights the potential for polymer therapeutics to provide a platform for bioresponsive drug/protein delivery in the field of ophthalmology. The descriptor ‘polymer therapeutic’ is an umbrella term used to describe polymeric drugs, polymer–drug conjugates, polyplexes, polymer–protein conjugates, and polymeric micelles, to which a drug can be bound.1 In the context of polymer–protein conjugates, the stability and solubility of proteins can be enhanced, and their biological half-life and immunogenicity reduced, via polymer conjugation.2 3 To this date, although polymer therapeutics have been licensed for use in humans (table 1), they have not been investigated widely in the field of corneal wound healing. We have evaluated the efficacy of single dose dextrin–rhEGF in an ex vivo organ culture model of corneal wound healing.19 20 The synthesis and characterisation of the conjugate was reproducible (figure 1).4 Two-month-old male Wistar Han rats (250–300 g; Charles River Laboratories, Margate, UK) were sacrificed by CO2 asphyxiation, confirmed by cervical dislocation. Wounding was performed within 1 h of sacrifice. The globe was irrigated with Balanced Salt Solution (BSS Plus®; Alcon Laboratories, Hemel Hemstead, UK) containing 0.1% EDTA. A full-thickness 2 mm corneal abrasion was produced by excision. The globe was then enucleated. Tissue culture medium (DMEM supplemented with penicillin G, 100 U/ml; streptomycin sulphate, 100 μg/ml; amphotericin B, 0.25 μg/ml; L-glutamine, 2 mM (Invitrogen, Paisley, UK): serum-free media (SFM)) was supplemented with study compounds, as shown in table 2, and added to the globes (n=4). Specimens were maintained at 37°C/5% CO2 for 64 h. Wound healing was assessed by digital wound photography and fluorescein staining. After 64 h, globes were fixed in 10% formal saline, embedded in wax, sectioned and stained with H&E. Statistical analyses were undertaken using GraphPad Prism®, version 4.00 (GraphPad Software). Data were compared using a 1-way ANOVA, with a Bonferroni post test for group analysis. Results were expressed as a mean and SD. Statistical significance was considered at a probability of p<0.05. The Polymer-masking UnMasking Protein Therapy (PUMPT) hypothesis. Succinoylated dextrin is conjugated to recombinant human epidermal growth factor (rhEGF) using EDC and sulfo-NHS cross-linkers to produce a dextrin–rhEGF polymer–protein conjugate. On exposure to α-amylase (present in human tear fluid), bioactive rhEGF is released from the polymer in a controlled release fashion. rhEGF would induce corneal epithelial cell proliferation and migration, whilst the polymer would be metabolised to the maltose and isomaltose disaccharide units. RT, room temperature. This ex vivo model of corneal wound healing was sensitive to stimulation by fetal calf serum and by dextrin–rhEGF. In the conjugated form, the rhEGF promoted a significant increase in the rate of corneal wound healing, with wound closure by 48 h, in the presence of human physiological levels of α-amylase compared with free rhEGF. With the addition of exogenous α-amylase, at physiological concentrations, rhEGF was released, or ‘unmasked’ from the polymer, thereby restoring bioactivity (figures 2 and 3). Typical ex vivo corneal wound closure images. (A) Healing of the corneal abrasion in serum-free conditions over 64 h. (B) Healing of the corneal abrasion in 10% fetal calf serum (FCS)—supplemented media. (C–H) Typical fluorescein staining of the corneal wound in the remaining study groups at 48 h.
(A) Haematoxylin/eosin staining of a section through a corneal abrasion in the absence of fetal calf serum (FCS). (B) Haematoxylin/eosin staining of a section through a region of corneal abrasion in presence of FCS. Both specimens were harvested at 64 h. The corneal wound is still evident in the absence of FCS supplementation (Wm, wound margin) (magnification ×20). There was a significant improvement in wound healing (p<0.006), in response to serum-containing medium (SCM; group 2), compared with the serum-free (SFM; group 1) and α-amylase (group 3) controls at 24 h (figure 4A). All wounds in the SCM group (group 2) had fully re-epithelialised by 48 h, while the average wound areas in the serum-free controls (groups 1 and 3) were 24.5±8.1% and 31.4±5%, respectively, of that at time 0 h (p<0.001). In the unconjugated rhEGF groups (groups 4 and 5), there were no significant effects on wound re-epithelialisation (p>0.05) at either concentration and neither resulted in total wound re-epithelialisation. Wound areas at 64 h were 5.6±11.3% and 23.4±21.4% of the total wound area at time 0 h for the 10 μg/ml rhEGF and 1 μg/ml rhEGF groups, respectively (mean±SD) (figure 4B). (A) Healing of the corneal wound (% reduction in wound area compared to 0 h) over 64 h in response to fetal calf serum (FCS) (serum-containing media) and serum-free controls. There was a significant decrease (*p<0.006) in the wound area in response to FCS when compared with serum-free controls. (B) The corneal wound area reduction in response to free recombinant human epidermal growth factor (rhEGF). The initial rate of wound area reduction (over the first 24 h) was not significantly different (p>0.05) from FCS, but the effect was not sustained over 64 h. (C) The corneal wound area reduction in response to dextrin–rhEGF. In the ‘masked’ (α-amylase-free) state, the bioactivity of dextrin–rhEGF was reduced to that of serum-free controls (p>0.05), but upon the addition of α-amylase at physiological concentrations, bioactivity was significantly restored (**p<0.006). Dextrin–rhEGF was most effective at the 1 μg/ml concentration (***p=0.027) compared with the conjugate at 10 μg/ml concentrations. In the dextrin–rhEGF conjugate study groups (groups 6–8), there was failed re-epithelialisation, in the absence of physiological concentrations of α-amylase (group 6; ‘masked’), with an abrasion of 23.4±5.5% of that at time 0, persisting at 64 h. This was not significantly different to the SFM control (group 1) (p>0.05). Upon the addition of α-amylase (93 IU/l; ‘unmasking’), there was a significant decrease in the wound area at 24 h in both the 1 μg/ml rhEGF equivalent (group 7) and 10 μg/ml rhEGF equivalent (group 8) groups (p<0.006). The dextrin–rhEGF conjugate was significantly more effective at decreasing the wound area at 24 h at the lower dose (1 μg/ml rhEGF equivalent) than at the higher dose (10 μg/ml rhEGF equivalent) (p=0.027) (figure 4C). The increased efficacy of the dextrin–rhEGF conjugate in enhancing corneal wound healing may be due to the sustained release phenomena.4 In the ex vivo model described herein, the rhEGF was applied as a single dose at the outset of the experiment, and the free rhEGF may have been degraded because of the short half-life of EGF.18 Although initial wound closure rates are similar in the first 24 h between rhEGF and dextrin–rhEGF (+α-amylase), this apparent difference tailed off as time progressed. In the ex vivo organ culture model, the pharmacokinetics of EGF will differ but the sustained release of rhEGF from the α-amylase-mediated, degradation of the dextrin–rhEGF conjugate may account for the enhanced wound healing in the dextrin–rhEGF study groups. The ex vivo model of corneal wound healing has been shown to be reproducible and that it is a reliable model for further analysis of polymer–protein conjugates. This is the first application of polymer therapeutics specifically designed for tissue regeneration in such a model, and these preliminary investigations highlight the potential for the application of these therapeutics to enhance corneal wound healing. This application of a specific endogenous trigger to promote the controlled release of a bioactive peptide may be applied to the healing and/or regeneration of other tissues in the future. The authors would like to acknowledge support from EPSRC platform grant No. EP/C 013220/1.
. The dawning era of polymer therapeutics. Nat Rev Drug Discov 2003;2:347–60.
. Introduction and overview of peptide and protein pegylation. Adv Drug Deliv Rev 2002;54:453–6.
. PEGylation, successful approach to drug delivery. Drug Discov Today 2005;10:1451–8.
. Dextrin–rhEGF conjugates as bioresponsive nanomedicines for wound repair. J Control Release 2008;130:275–83.
. Amylase in human tear fluid: origin and characteristics, compared with salivary and urinary amylases. Exp Eye Res 1975;21:395–403.
. Icodextrin provides long dwell peritoneal dialysis and maintenance of intraperitoneal volume. Artif Organs 1998;22:8–12.
. Polymer masked-unmasked protein therapy. 1. Bioresponsive dextrin-trypsin and -melanocyte stimulating hormone conjugates designed for alpha-amylase activation. Biomacromolecules 2008;9:1146–54.
. Selective binding of the epidermal growth factor and its specific effects on the epithelial cells of the cornea. Exp Eye Res 1972;14:135–41.
. Proliferation of corneal epithelium induced by epidermal growth factor. Exp Eye Res 1973;15:361–6.
. Kinetics of corneal epithelial regeneration and epidermal growth factor. Invest Ophthalmol Vis Sci 1974;13:804–9.
. Stimulatory effects of fibronectin and EGF on migration of corneal epithelial cells. Invest Ophthalmol Vis Sci 1987;28:205–11.
. Epidermal growth factor in alkali burned corneal epithelial wound healing. Am J Ophthalmol 1987;103:802–7.
. Effect of EGF dosage forms on alkali burned corneal wound healing of mice. Burns 1995;21:7–10.
. Epidermal growth factor in topical treatment following epikeratoplasty. Ophthalmologica 1992;205:121–4.
. Epidermal growth factor in the topical treatment of traumatic corneal ulcers. Ophthalmologica 1993;206:119–24.
. Epidermal growth factor in the topical treatment of herpetic corneal ulcers. Ophthalmologica 1994;208:37–40.
. Influence of topical human epidermal growth factor on postkeratoplasty re-epithelialisation. Br J Ophthalmol 1997;81:391–5.
. Pharmacokinetic study of recombinant human epidermal growth factor in the anterior eye. Invest Ophthalmol Vis Sci 1991;32:3209–15.
. Increased apoptosis and abnormal wound healing responses in the heterozygous Pax6+/− mouse cornea. Invest Ophthalmol Vis Sci 2006;47:1911–17.
. Wound healing in rat cornea: the role of electric currents. FASEB J 2005;19:379–86. Funding JH was funded by a Fellowship from The Healing Foundation (Registered Charity No. 1078666) and the Welsh Office for Research and Development (WORD).